I have a background in conservation science and over ten years experience with information technology management and online education. I thrive on collaborative projects that move our world towards sustainability and interconnectedness. What’s the first thing you think of when someone asks you about your trip to the zoo or aquarium? It’s likely the animal and marine life you encountered—not the records behind the scenes. But those institutions must show evidence of having modern (preferably electronic) records management systems for managing animal records, veterinary records, and other relevant information. 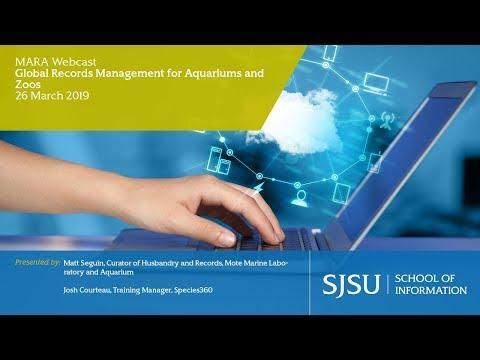 Guest speaker Josh Courteau will discuss the role records play in managing a world’s worth of animal data and describe the Zoological Information Management System (ZIMS) used by more than 1,100 institutions in over 96 countries. Guest speaker Matt Seguin will discuss research being conducted at Mote Marine Laboratory and his role in maintaining accurate physical and digital records of the animals in the collection.